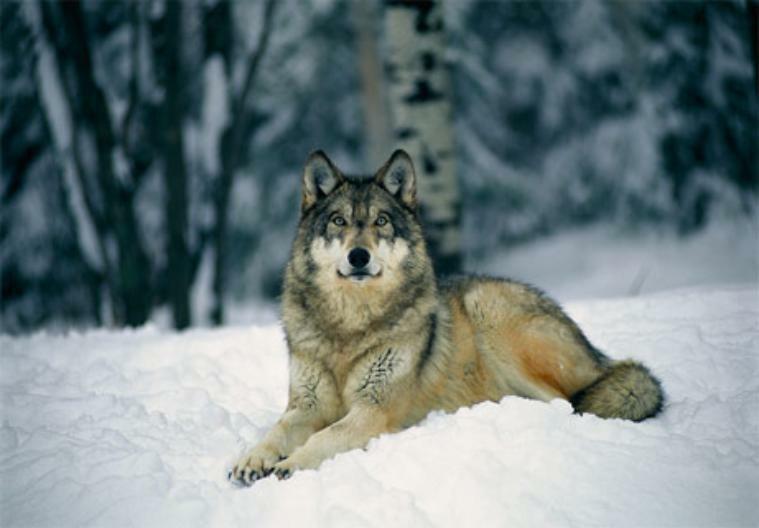 For thousands of years wolves were the second most widespread land mammals, after people. them extremely successful predators—and humans’ strongest competition for meat. nearly gone in most parts of the United States, including Yellowstone National Park. grown, and it has become a symbol of wildlife in peril. National Park, the U.S. Fish and Wildlife Service decided it was time to bring the wolf back. to ten weeks in temporary outdoor pens. featured in Return of the Wolf—were set free. the federal government ruled that ranchers could kill wolves caught attacking their animals. then were released into the Lamar Valley in northeastern Yellowstone. outfitted with a radio collar that tracks their location. pups. One sister, 42, remains in the pack, and the two are constantly at odds. Nicknamed “Cinderella” by the Yellowstone researchers, Wolf 42 is the beta female in the group. her is growing, and 42’s position is precarious. than 20 years. He has observed the Druid Peak pack since their release in 1996. The decision to return wolves to Yellowstone was a controversial one. What is the debate about? politically. They don’t want the federal government dictating what is happening on their own land. How much of the controversy do you attribute to the psychological fear of wolves? afraid of people. The wolves are a symbol of evil in our culture, and that has hurt them immensely. species on Earth. Now we’re trying to right some longstanding wrongs in nature. years to educate people as to what they are really like. Won’t a rancher who has lost livestock feel an impact financially? have to feed on livestock. Are ranchers the only ones opposed to the recovery project? the herds from getting too large has been an issue. Was the Druid Peak group an existing pack, or did the wolves form one at the park? seems so brutal. Is that typical wolf behavior? What surprised you the most during the restoration project? Canada to capture more wolves, but as it turned out, that wasn’t necessary. What was the most difficult part of the reintroduction project? big setback. We lost key individuals. hat do you feel people need to know about wolves? zone ecosystem in the world, and it was missing its top carnivore. Now it’s complete.